The brand new Fence Anchoring System. Unique 'fins' use the strength of the soil itself to hold the fence posts fast and steady. Strong - test independently to be stronger than metal post spikes. Simple to use - no special skills required, nail on and dig in, and easy to adjust and easy to remove. Supplied as one galvanised steel fin, fits a 3' x 3' (7.5cm) fencepost and requires 24 galvanised nails per post to fix. 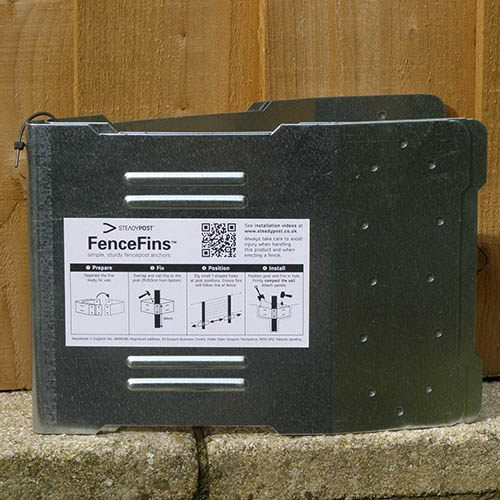 The brand new Fence Anchoring System, 'FenceFins' have been designed and manufactured in the UK to offer a simple, re-useable and effective fence post fixing system. No more concreting in or banging on metal fixing spikes - never to be got out ever again if you get them wrong! Fence Fins' unique design works on the principle that support is mainly needed in the plane of the fence alone. It's unique 'fins' use the strength of the soil itself to hold the Fence posts fast and steady. They simply nail on to the fence post, and the unique 'fins' extend only along the fenceline, providing lateral support. This means they can be installed close up to exisitng walls or boundaries, as well as planted or lawned up close to as well. UK manufactured and designed - galvanised steel to last, Fits a 3' x 3' (7.5cm) fencepost. Requires 24 galvanised nails per post to fix.